I'll give it a 100 out of 10!! 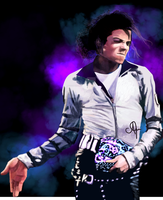 MJ is the KING not only of pop but of music i don't get how are they comparing Justin Bieber to him BUT MJ ROCKS AND I LOVEEEE HIM I WISH HE HAVE NEVER DIED BUT WE ALL KNOW HE DIDN'T LEAVE US AT ALL AND HE IS HERE EVERY TIME WE SING,THINK OF HIM, SAY HIS NAME AND EVERY TIME WE HOPE!!!!!!!!!!!!!!!!!!!!!!!!!!! It is fantastic... great work! Very nice effect!What a masterpiece! I hope you didn't mind. xD haha ty your art is so awesome.